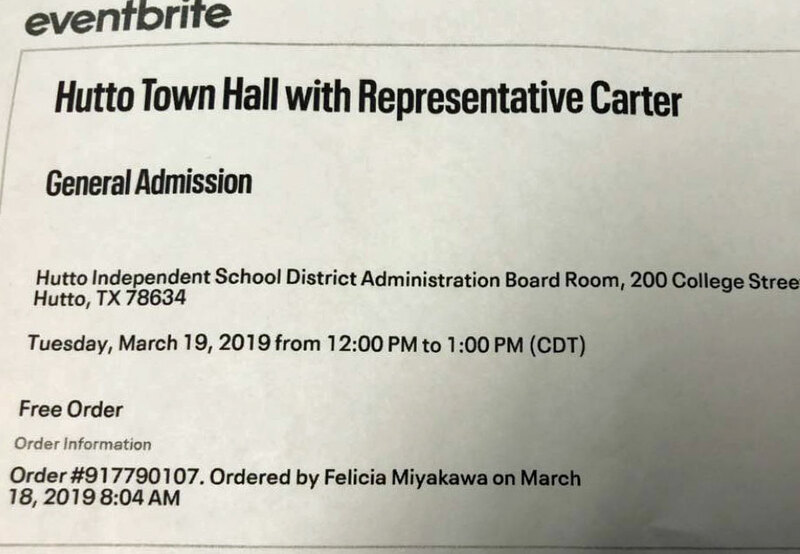 On Tuesday, March 19, I attended an extremely rare event: my Congressman, John Carter, held an actual in-person town hall, for the first time since at least 2013. 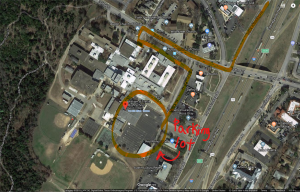 It was poorly advertised (Facebook announcements began to circulate two days in advance), required advance registration (tickets were free), and held in a small space (the Hutto ISD Administrative Board Room). Nevertheless, about 50 people gathered to ask our long-absent Congressman questions. I was one of the first guests to arrive, so I got to see the event preparations, which included a SWAT team and Williamson County sheriff’s department doing a security check and setting up a perimeter. Yes, a SWAT team. There were several armed police officers at the entrance even after we were seated. There was also at least one bodyguard. I didn’t do an official count, but I think there were six to eight obviously armed personnel on the premises. Presumably, this security team was provided by taxpayer dollars. For readers who don’t live in TX 31, let me put this into context: our Congressman has done nothing to advance gun control measures and actively opposes any kind of commonsense gun reform. Two years ago I personally contacted his office to ask about in-person town halls, and they told me that after Gabby Giffords got shot, they weren’t going to take any chances and instead were doing tele-town hall meetings. The presence of the SWAT team was therefore the height of irony. I can only assume that John Carter is clearly terrified of his constituents, yet he does nothing to protect us. The town hall itself was a typical question-and-answer format. I expected that his staff would pre-screen questions, but this was not the case. Congressman Carter took questions for about an hour, and it was my impression that everyone who wanted to ask a question was able to do so. He opened with a statement about being there to learn from us and to have real conversation. Unfortunately, each time he was asked a question that did not conform to his worldview, his responses devolved into partisan pivots and whataboutism. Residents of TX 31 have been objecting to lack of access to our Congressman for years. In her question, Dr. Christine Eady Mann (who ran for the Democratic nomination for TX 31 in 2018) reminded Carter that back in 2017 his office banned her from coming back to talk to them any more about health care; they even threatened to call the police. She wanted to know if his office would continue to abide by this policy, or if they would open their office up to constituents who disagree with his positions. He responded that folks who disagree with him are welcome to come back, but not about the same issue. It is, apparently, a waste of his time to talk to people more than once about an issue. Curiously, he didn’t seem to notice that the social security benefits he admitted receiving are “socialist” benefits. Nevertheless, many folks wanted to discuss health care; there were questions about the broken VA medical system, expanding health care for the elderly and for disabled children, and how he will support the overlapping medical and education needs of children with disabilities. One constituent asked a specific question about whether or not we could divert some of our discretionary military funding into health care. Carter argued the specifics of how much is discretionary and in the end declared “I’m not a socialist. I do not support socialist ideas. Socialism doesn’t work.” Curiously, he didn’t seem to notice that the social security benefits he admitted receiving are “socialist” benefits. In the midst of responding to one of the health care questions—a very serious plea for help for a chronically ill child—Carter suddenly called out Christine Mann (“that young lady over there”) as a “demonstrator”: “she demonstrates outside my office all the time!” If there was a contextual link to the constituent’s question, I missed it. If I had been looking for an indication that my Congressman understands climate science, I did not find it in his response. I asked a question about the environment. Given the uptick in natural disasters and recent volume of scientific studies showing that we are already dealing with climate change and that it’s only going to get worse, I wanted to know what he’s doing to leave a livable planet for our children and grandchildren. He said he’s in favor of all forms of energy: wind, solar, hydroelectric, and “clean” coal. “If this is really the disaster we’re talking about,” he said, then scientists would come up with a plan. And they haven’t yet, he said, so there’s nothing specific to do. Furthermore, he said, other countries (he named China and India) aren’t doing anything about climate change; why should we pay for it when they aren’t willing to do the work? In perhaps my favorite pivot of the day, he pointed out that every time we exhale, we add carbon dioxide to the atmosphere but we can’t very well kill people off just to save the planet. If I had been looking for an indication that my Congressman understands climate science, I did not find it in his response. Two constituents asked him about H.R. 1, which he voted against. When asked which section of H.R. 1 he disagreed with, he said “All of it. It’s about Democrats win and Republicans lose.” When asked about whether or not he supports term limits: “no; it’s hard to even know where the bathrooms are after 6 years.” When asked if he supports independent redistricting committees he said “no,” and pointed to the example of California: “Nothing good comes out of California,” he informed us. One constituent asked him what he’s doing about immigration reform. He informed us that he’s got a bill ready in his desk and he has shopped it around to both parties, but neither party wants the bill. He gave us no details about the bill. While most of his responses reflected partisan bias, insufficient understanding of the issues, or deliberate deflections away from the actual issues, I found common ground with Carter when he answered a question about how we, a community divided by politics, can work together to solve problems. He told us we need to get to know our neighbors, socialize with each other, and learn about our commonalities rather than focusing on our differences. Unfortunately, he did not model how to do this within the town hall. I left unconvinced that he sees us as anything other than partisan demonstrators. He certainly did not work with us to solve the problems we face every day. *I have kept all constituent names except for my own and that of Dr. Christine Eady Mann anonymous to protect their privacy. Next week: PART TWO! Dr. Christine Eady Mann covers Rep. Carter’s second town hall in Leander. Amid the usual cyclone of horrific news from the Republican administration’s White House, there is this enormous sign of our growing impact and reason for hope: The spirit of opposition that emerged after the inauguration spilled over into town hall meetings held across the country by Republican lawmakers on recess, and the GOP sees us now, and realize we are many and mighty–and they are afraid, as seen by their continuing efforts to discredit this huge grassroots movement as “paid protesters” of “liberal extremists,” rather than the organic bipartisan efforts of more than half the country to oppose the unconstitutional, unethical, potentially illegal actions of Donald and his toadies. Keep the heat on! 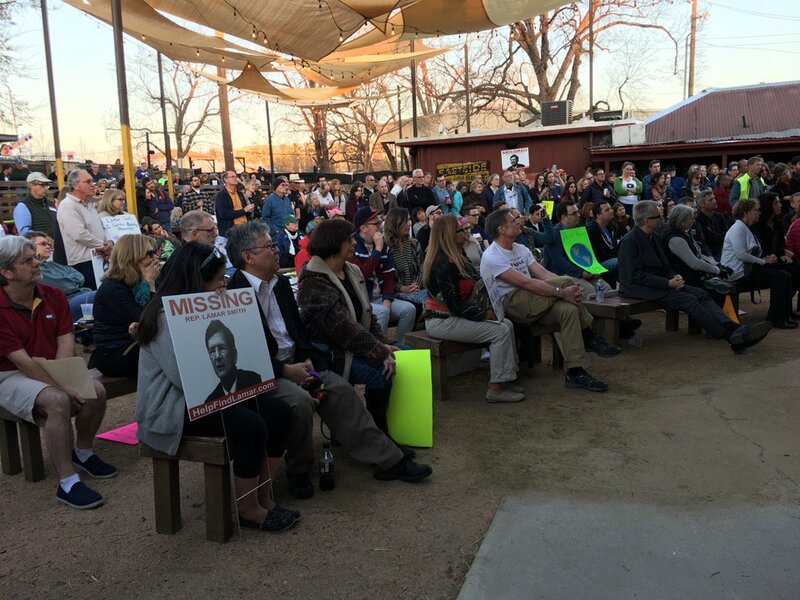 Here in Austin and surrounding areas, more than 2,000 people attended Town Hall meetings for representatives in all five Republican congressional districts, plus one for Sens. Cruz and Cornyn. UPDATED: Upcoming Town Halls – Really! One of the core tactics in the Indivisible Guide is to attend Town Halls where you can speak directly to your Members of Congress (MoCs). But what do we do when our MoCs refuse to hold a Town Hall–even during next week’s recess when they are supposed to be in their districts? Answer: You hold one anyway! Below are the “mock” Town Halls scheduled so far. In each case, the MoC has been invited to attend and may even show up. But that won’t stop constituents from gathering and raising their concerns. We hear cardboard cutouts, puppets, and other MoC stand-ins will in attendance. Sunday, February 19, 7:30-8:30 p.m.
Monday, February 20, 6-8 p.m.
Wednesday, February 22, 7:30-8:30 p.m.
We’ll update this page as new info comes in. Posted in Districts, Meetups, Town HallsTagged Town Halls24 Comments on UPDATED: Upcoming Town Halls – Really!